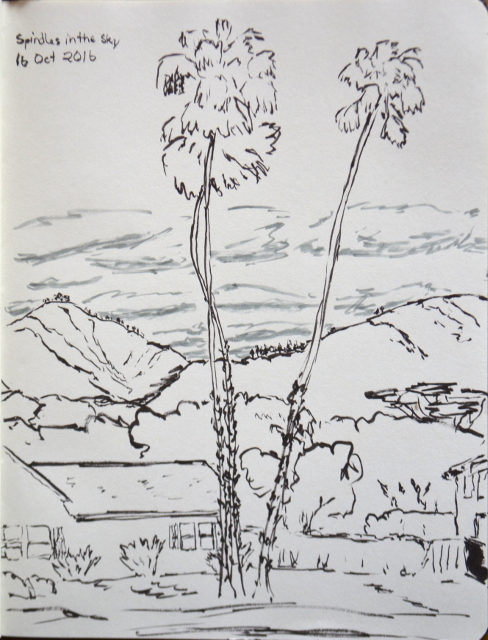 The park nearby, but the palms weren't given the height they have. The palms again in the park nearby. Stopping by the official camp one afternoon after trail work. This weekend, I am joining up with a big celebration of the Hundred Peaks Section. Virginia Simpson is finishing the peak list and Bill Simpson is finishing leading other people up every peak on the list for the fourth time. They picked a mountain with a road up so that those who cannot hike can go too. Unfortunately, the road has not actually been open for a while, so everyone will be hiking in anyway. It is about 5.5 miles on trail then a last push up the mountain to the finish. The requirement to hike a decent number of miles does not seem to have reduced the crowd any. At least there is plenty of parking for them. 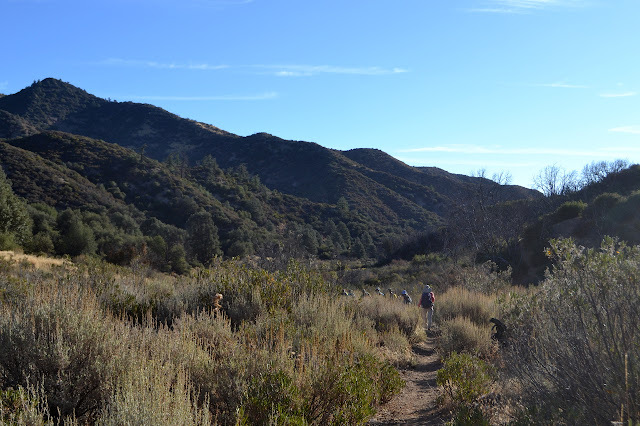 We are a little later than scheduled as we start up the Pacific Crest Trail to Pacifico Mountain. This is how a Hundred Peaks party gets started. 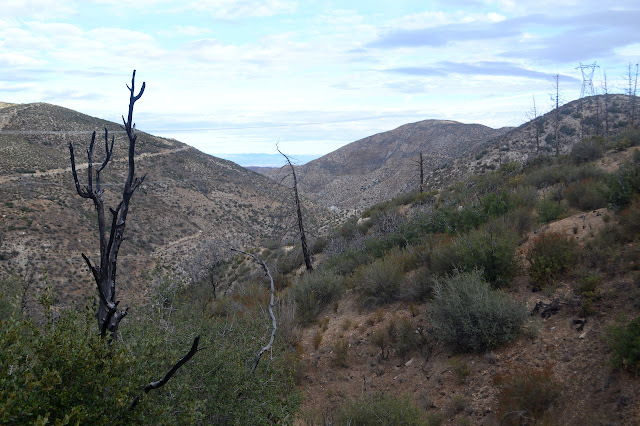 The area was burned by the Station Fire in 2009 and the hillsides are a bit more open than they used to be. Counting the people as we stop to lose a layer in the chill and overcast day, there seem to be about 68±2 people on the hike today. It is quite crazy. The hills are hilly and covered in short stuff. I joined up with the "working vacation", the third of the year being put on by Los Padres Forest Association, for Monday through Friday. I had my fun planned for Saturday and more fun planned for next Saturday, so that is what I can fit. 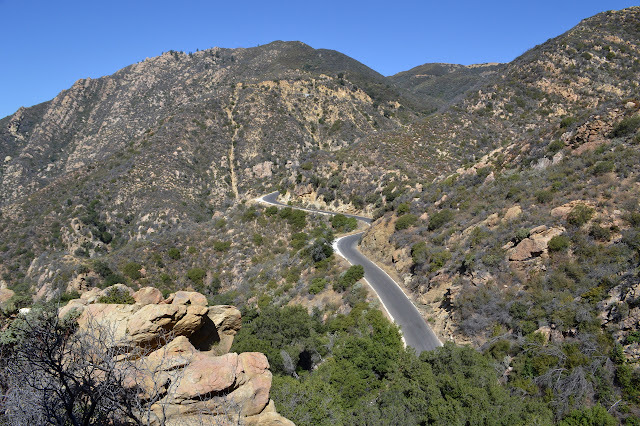 We hit Cachuma Saddle a little before sunrise to drive up the road to the trailhead. I jump in one of the more capable cars and watch the road as we go. There are a couple spots that look like they would be tough with the little car, then one that looks highly improbable. John says they brought out a jack hammer to this spot once to make it as passable as it is. He will be coming out on Sunday, but seems to be worried about all the things he has on his plate to do and is thinking about coming out on Friday with me. That would be great, because then I would have a ride out. Otherwise, I have to walk all the way out since right now, no one else is leaving that day. We stop by McKinley Springs where the support stock are staying. Right now, that is two horses and a mule, but there were a few more mules on the weekend and they will be back for the haul out next weekend. We get them loaded up with whatever is still needed down at camp for the next few days. Mostly, that means beer and ice. There is space for some gear, so we lighten our packs a little. There is a lot more room, but we do not want to completely let go of our packs. Once the animals are loaded, we finish the drive and get started on the hike in. Looking back at McKinley Saddle as the stock start up it behind us. 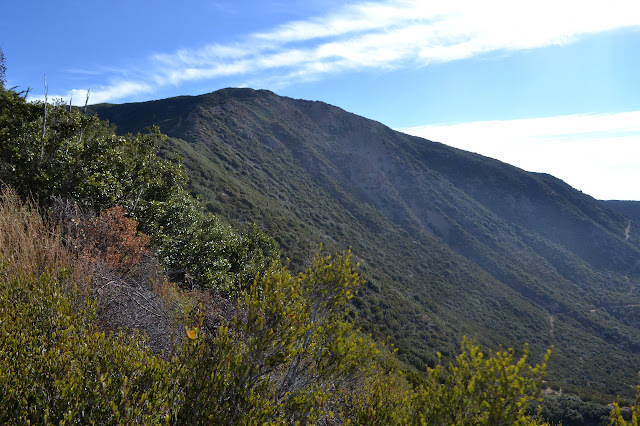 The McKinley Fire Trail snakes its way around the side of the next peak on its way to Santa Cruz Station. The weather is superb today. The previous days have been variously a bit hot or a lot windy, but today is comfortable and the air is not making standing difficult. It would be hard to ask for a better day to be hiking in on. Hurricane Deck in the distance. 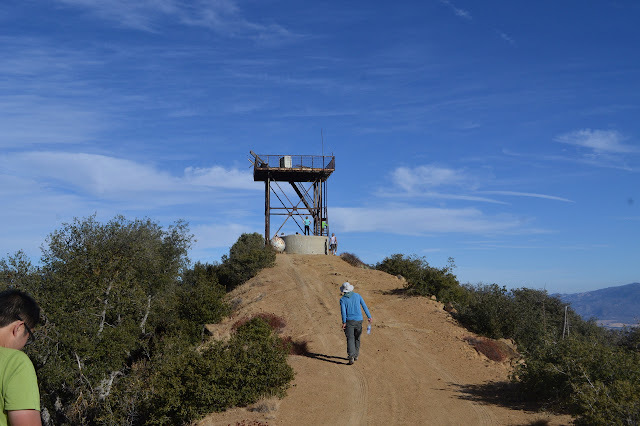 After hiking to Lizard Head, we went up to the fire lookout on top of Cuyama Peak. Unfortunately, the lookout collapsed almost four years ago, so it is not as impressive as it once was. 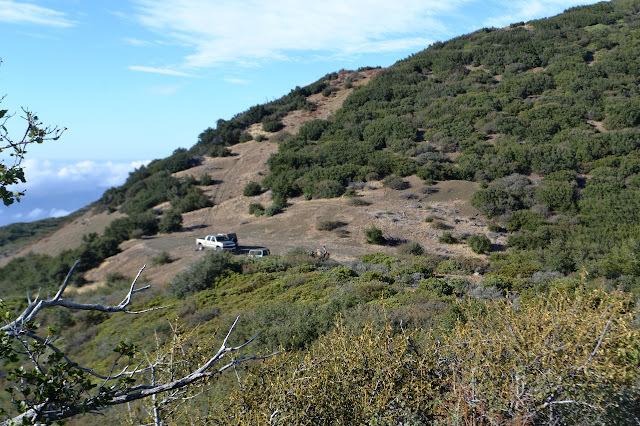 We stopped about 250 feet short of the fire lookout, but it is possible to drive all the way up. Wood that was once walls and roof of the fire lookout. With the fall and the falling temperatures, the Hundred Peaks Section calendar is really filling up. 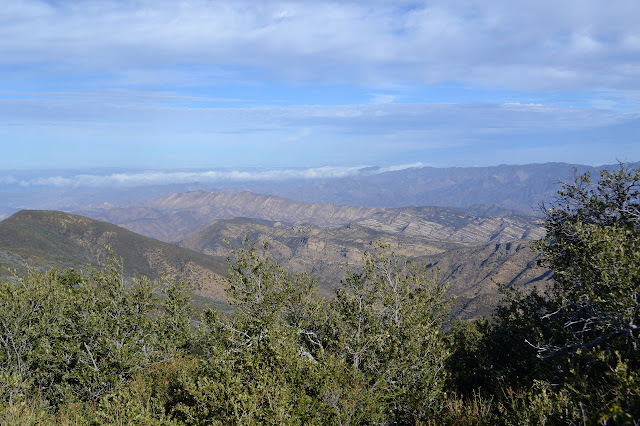 I decided to go for a day climbing a spot on a map I had noticed once and then driving up to visit the collapsed fire lookout on Cuyama Peak. Since the expected temperature is not quite so low as we would hope, Bill decided we should all get a nice, early start. 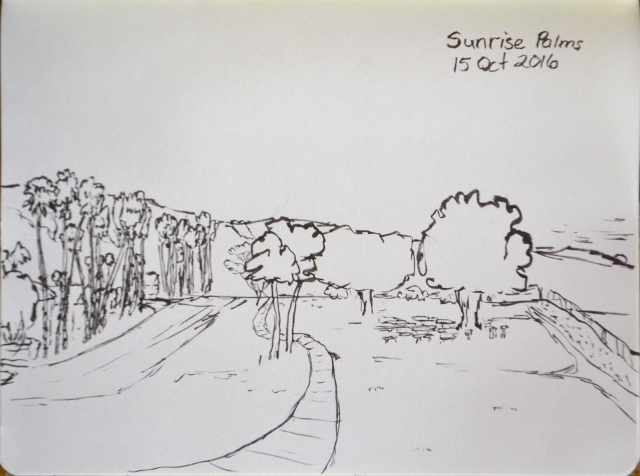 Our early start got lost a bit with some unforeseen traffic, but we still found our way to the upper end of Tinta Trail with the sun low in the sky and the air a little bit crisp. Starting down the motorcycle trail while the shadows are still a little long. It is a touch cool right at the trailhead, but as we turn the corner and start hiking into the sun in the wide canyon. 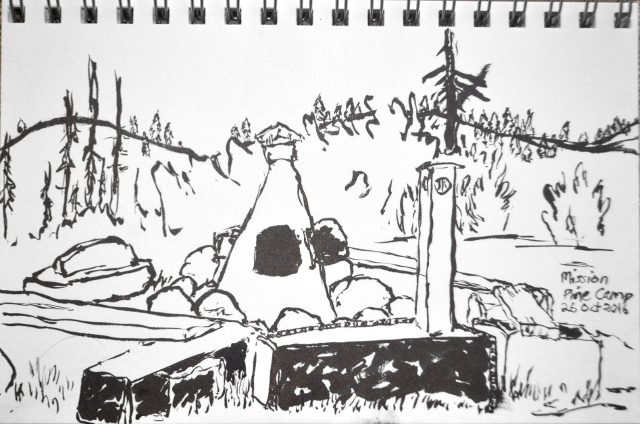 The lookout base sits high on the peak to our left. There is hardly any slope to the trail. It is an easy stroll until we reach the old Upper Tinta Camp. We stop for a minute in the camp, which is marked only by a few trails and a fire ring full of the remains of a few generations of stoves, before moving on. 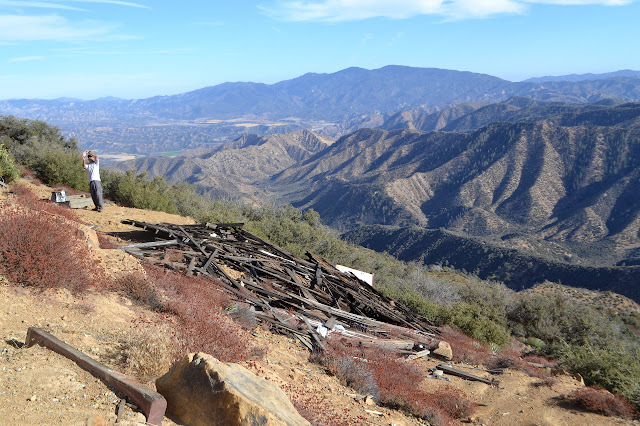 The fire lookout skeleton is visible high on Cuyama Peak. Hiking through the wide canyon. Instant oatmeal: The standard breakfast backpacking is instant oatmeal and hot chocolate. So is the standard breakfast car camping. We would go car camping for a month at a time as children and I developed a strong aversion to both instant oatmeal (always fruit and cream flavors) and hot chocolate. For a while, I thought I could eat none of it, but then I found that I could eat apples and cinnamon instant oatmeal (briefly) and the extra chocolate hot chocolate version sold as "dark chocolate". I have also had good luck adding in a packet of "instant oatmeal" that was full of hardy things like flax seeds. It is the texture that gets to me, and this is sufficient to change it for the most part. I still have a cup of cider nearby to help wash it down if my body decides to revolt and my stomach try to convulse. Yes, my revulsion is that extreme. It is no way to start a day. I need something else. Soup packets: As a teen heading out for 10 days, I dropped in a couple packets of split pea soup for each morning. It was delicious confined to that time, powered a kid who tended to have a suppressed appetite when hiking, and probably even good for me. It is also hard to find these days, especially if you'd rather not have one with bacon. Couscous: I have often had couscous for breakfast with lots of fruit and cinnamon and/or allspice and nutmeg and maybe ginger. There should be lots of spice to fill in lots of flavor. Except for cloves. They should be used sparingly. I have been told that this is entirely the wrong way to do couscous and can only respond with, "Oh? Is it?" I put enough for breakfast into a little sandwich baggie and squeeze out the air and tie it off. Cooking, I'll heat water and pour some out into a cup for my hot drink and then just poke a hole and spill the mixture into the hot water. It does not need to boil for two minutes, it just needs hot water for a few minutes. This is often my staple for breakfast these days, but I get hungry again quickly. Adding protein is suggested to help slowing down getting hungry. I have tried it with ground flax and ground almond, both of which made it gritty and suppressed the flavors of the spices. Milk powder is not an improvement either. 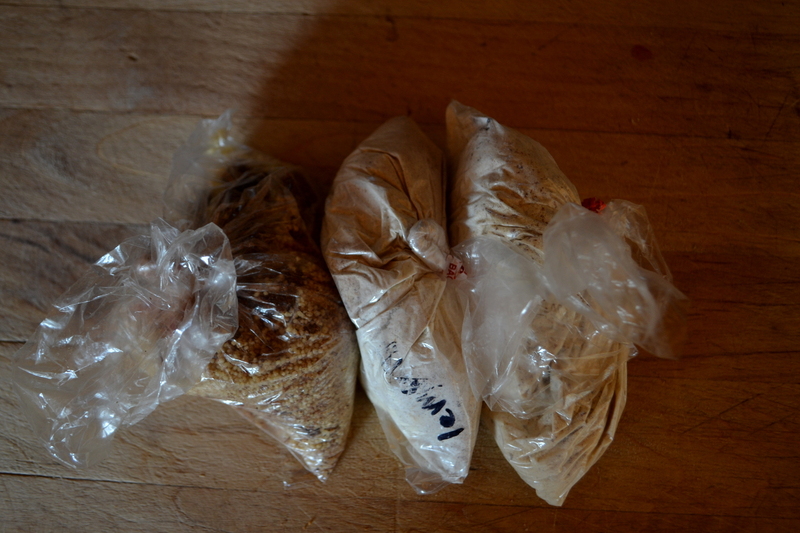 Bag of couscous and a couple of bread mixings. 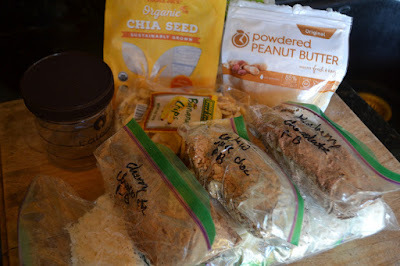 Chia seeds: Following a somewhat random set of PCT through hikers, I bumped into a chia seed pudding recipe. This particular recipe is nice for not suggesting that you must put in this kind of nut or that kind of fruit and thus clearly establishing some level of variety. I had some on my hike in the Flat Tops and a few other places. First observation was that I cannot stand to eat out of a bag. The bags I had handy were kind of tall and my fingers got dirty on the sides, so I got some shorter ones that still fit everything. My fingers got less dirty and it was still a miserable thing to eat out of a floppy bag. The first time I made it in a Talenti container instead was the first time I actually came up with a pudding product instead of a runny mess with chia seeds at the bottom, too. In fact, it was a little too set up, but it was well mixed. Some mixed up pudding, some "blanks", and the fixings. Real oatmeal: Oatmeal is still a viable option, but not instant. 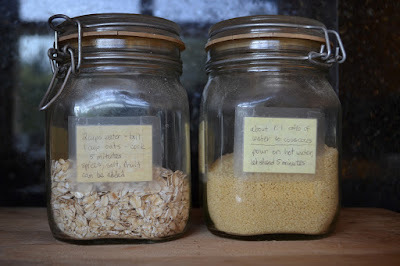 The various 5 minute oats, steel cut or whole, can be cooked up almost as easily as couscous. I want it with fruit and loads of spices, just the same as the couscous. The bigger bottles of cinnamon are higher quality stuff anyway, so you might as well indulge. Oats and couscous, but do not carry them like this. Same theme as oatmeal: There is such a thing as instant grits, too. Maybe someday I should try this. Cream of Wheat is fast and can be adulterated to edible, which is, if I am honest, how I treat oatmeal and couscous. Bread: Bread is good for breakfast and can be cooked on the right backpacking stove, but it does take a bit more time. One could make it in the evening, but then it will be cold when eaten. It is an excellent option for a lazy day. To do the baking, the heat from the stove must be sufficiently low. There seem to be two methods used. By far the most common is to divert the heat, usually using a double pot setup. I have experimented with just a layered aluminum piece to tuck under my pot and had pretty good luck with it. This does mean extra tools (weight) and extra fuel (weight and waste). Some are able to cook by simply having a low enough flame in the first place. Another option for a slow burn is cooking with a tea light. The recipes in the link use cake mixes and such, which I find distasteful. 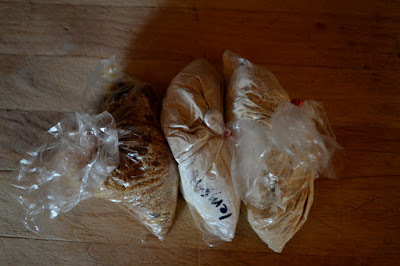 The bags pictured above by the couscous are 1/2 cup flour, spices, and 1/2 teaspoon baking powder. Simple. Seriously, biscuit mix is a waste of money. I have tried it also with a bit of whole wheat, corn, garbanzo, soy, rye, teff, and probably something more I have forgotten. Add in flax and ground nuts and fruits and dried milk for all kinds of flavor too. When it comes to bread, the grainier, the better. For cleanup, the slower the heating, the less likely it is to burn on. I also pour in plenty of oil, far more than needed against sticking, because oil is just good stuff for backpackers. There are lots of details with this and it will likely have a whole post after much experimenting. So far, very yummy, especially with raisins. Soy and garbanzo flours absolutely must get cooked well to taste good. More things like sweet potato mush: This guy seems to have a good handle on edible and hardy foods. Robert wanted to be shown the way up to "Medicine Circle" and I have been meaning to do it in the daylight so I can more easily go a little further to the peak nearby. 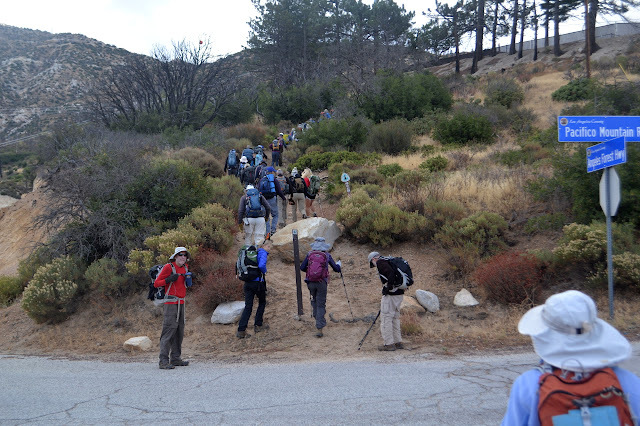 This is a common hike for the Wednesday "conditioning hike" that the local Sierra Club chapter hosts. (All are welcome to come to that. 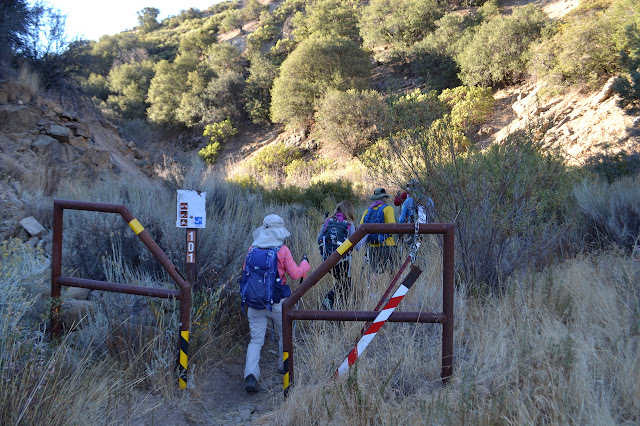 Hike participants meet at the Santa Barbara Mission at 6:30 PM on Wednesday.) 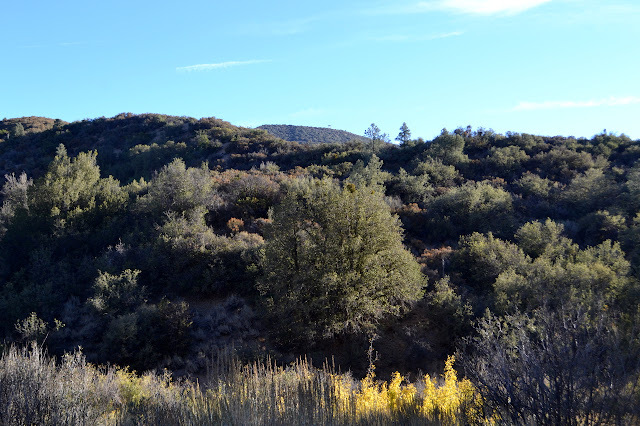 For that hike, we start at the Rattlesnake Canyon Trailhead and walk up to Gibraltar Road, then a little way along the road before starting up a rough use trail. You know a hike has to have something good to be popular in spite of it involving a road walk. For Robert, I am cutting off those initial three miles and starting at Gibraltar Road. We find parking easily enough near Gibraltar Rock as no one seems to be climbing today. The trail is easy to spot heading east from beside the rock. The trail starts off near the road beside a pull in parking spot and wastes no time in starting to climb. Long miles are not to Robert's taste, but he likes the trail, such as it is, going up Cathedral Peak, so I felt safe in not warning him about this one. It starts off steep and quickly gets steeper. It was a little easier a year ago, but now some of the long dead fire victims are starting to tumble over onto the trail. There is also no denying that the trail through soft sandstone seems looser as the drought goes on. The first hundred feet of trail requires ducking under fallen brush, scrambling on sliding hillside, and more scrambling over boulders. And from there we are going up at least as much as across. One of the reasons the road section during the longer version of this hike is not so bad is that it provides a nice rest before hitting the hardest climb. Looking along Gibraltar Road as it climbs up the side of White Mountain. It feels like we have been climbing for a while whine I look down at the GPS to see that it has just now ticked all the way to 0.20 miles. 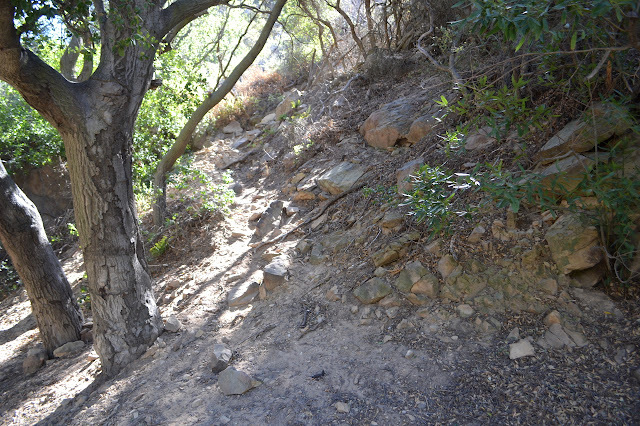 Ahead, the trail is still climbing steeply, but it is dropping off ever so slightly. There are still a few boulders to scramble up. 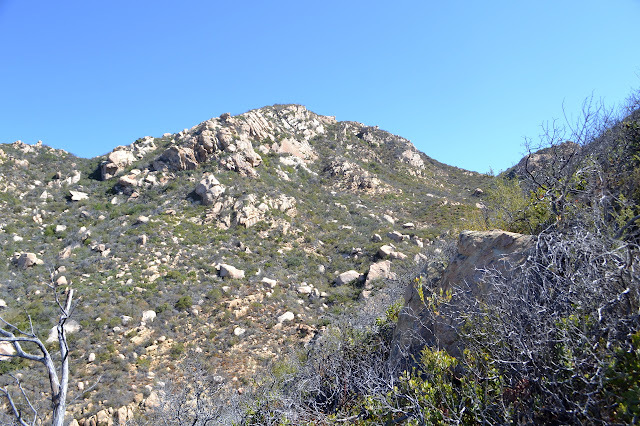 Our destination is another rocky ridge above.